I would like to introduce my church to you and provide you with a brief overview of our Coptic Orthodox Church, its doctrines and the highlights of the Christian faith in our homeland, Egypt. Saint Mark Coptic Orthodox Church in Burr Ridge, Illinois, was built in 1982. Its congregation includes roughly three hundred Egyptian families who come regularly from the Chicago Metropolitan area, Southern Wisconsin and Northern Indiana; a 75-mile-radius service area. This church is one of about 120 Coptic churches, which were consecrated across the US and Canada in the second half of this century to serve the Egyptian families who made North America their new homeland. 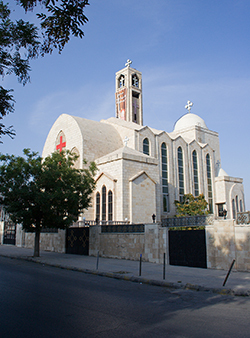 During the same period, some 60 other Coptic churches were consecrated in Africa, Europe and Australia. In our motherland, Egypt, there are several thousand Coptic churches where Egyptian Christians worship our Lord Jesus Christ. Some of those churches date back to the second century. In any Coptic Church, whether in Egypt or abroad, the Divine Liturgy is served in exactly the same way our ancestors used to worship; since the time of the early Church Fathers of the second and third centuries AD. All of these Churches serve the Egyptian Orthodox Christians, who are also called Copts, under the stewardship of the 116th Successor of Saint Mark, His Holiness Pope Shenouda III, Pope of Alexandria, and the Patriarch of the See of Saint Mark since 1970. Saint Mark began his missionary efforts in North Africa in the Year 62 AD. He preached Christianity and setup churches at Alexandria, Egypt and the Pentapolis Cities in North Africa - Libya, Algeria, Tunisia, Morocco. He established the first ever Theological School in Alexandria. He was called back to Rome to help Saint Paul in 67 AD (2 Timothy 4:11). After the martyrdom of Saint Paul and Saint Peter, he returned to Alexandria where he was martyred during the Easter service in 68 AD. "John, called Mark" (Acts 15:37) wrote the first of the four Gospels, known by his name in 65-68 AD. According to tradition, he was one of the Seventy Apostles appointed by the Lord before His final trip to Jerusalem (Luke 10:1) in 33 AD. When the angel of the Lord freed Peter from jail to save him from King Herod in the year 40 AD, he came to "the house of Mary, the mother of John whose surname was Mark" (Acts 12:12). It was in the upper room of that same house where the Lord washed the disciples feet, held the Last Supper with them and established the Sacrament of the Eucharist (Mark 14:15). It was in that same upper room also where the Holy Spirit came upon the disciples "like tongues of fire" in the day of the Pentecost (Acts 2:3). Saint Mark was the young man who followed Him to Gethsemane and ran away naked when Jesus was arrested (Mark 14:51-52). Accordingly, our Church calls Saint Mark the Beholder of the Lord. In the land of the Pharos, the ancient Egyptians believed in life after death and filled their tombs with the belongings of the deceased to use them when the soul returns to the entombed body. The ancient Egyptians believed in judgment after death which paved the way for Christianity to spread rapidly in Egypt upon hearing Saint Mark's preaching. The Egyptians easily related to Saint Mark's teaching about the Holy Trinity, the resurrection of Jesus Christ, the Son of God, and His Second Coming to judge the living and the dead. Notice that the picture below illustrates the process of judgment after death and that the heart of the dead man must weigh less than a feather to enjoy life in the palace of the gods. In a relatively short time Egypt became a Christian land. Many Egyptians converted to Is1am when Egypt came under the Arabic rule in the 6th Century AD and mingled in marriage with the Arabs. Those who remained Christians, on the other hand, preserved their Egyptian bloodline and therefore, were called Copts, from Agyptos. "Blessed is Egypt My People" (Isaiah 19:25). Today, the Coptic population constitutes about 15% of the Egyptians. Over 90% of the Copts are Christian Orthodox who, to this day, preserved the Apostolic Tradition as established by Saint Mark and the early Apostolic Fathers. The Coptic Church asserts that its doctrines are obtained from the Scriptures. It is well recognized that all Churches have the same claim to the very same Scriptures. But it could be said that the doctrines of this Church have been the same, with no additions or alterations from the teachings of early Christianity. On the one hand, its theology is based on nothing outside the Scriptures. On the other, its doctrines agree in all parts with those of the early Church, i.e. the Tradition. We treasure, and follow, the Tradition as the proper interpretation and application of the teachings of our Lord and the Apostles, as understood and practiced by the early Christians and leaders of the Church during the period of the One Universal Church until the division of the Council of Chalcedon in 451 AD. The Coptic Orthodox Church is one of the group called Oriental, or Non-Chalcedonian, Orthodox Churches. The separation between these churches and Europe took place in 451 AD at the Council of Chalcedon. The controversy was about the nature of our Lord, whether He would be described as having one or two natures. The Oriental Churches clung to the idea of the One Nature in Him, and are therefore called Monophysites; in contrast with the Duophysites of the West. Recently, in 1991, a declaration derived by theologians from the Eastern Orthodox and the Oriental Orthodox more accurately described our faith as Miaphysites, which means two natures in One. At the Council of Chalcedon, the Western Churches adopted Pope Leo of Rome's tome which spoke about two natures of the Lord. The one, the Divine, is resplendent with miracles, the other, the Human, submits to insults. The Orientals felt that this Duophysitism meant that there was in Christ only a fellowship between the divinity and the humanity of Jesus, not an unity. This belief shook the foundation of our Salvation which could only be based on the ground that Christ has one composite nature. We believe that there was no moment in history at which existed a separate human nature of the Lord to be united to His Divine nature, "not even for a twinkle of the eye", as we pray in our Liturgy. This is true from the moment of His incarnation into the womb of the Virgin, through baptism, crucifixion, burial, resurrection, ascension and henceforth until His Second Coming (Revelation 1:17-18). In the Gregorian Mass of our liturgical service we raise our supplications to the Son and address Him by those beautiful expressions: "0 You who are, who were, the Everlasting, and Perpetual; Co-Essential, Co-Enthroned and Co-Creator with the Father". Our Eucharist is a spiritual journey to worship Christ in heaven. There, we join the heavenly hosts, the Four Living Creatures, the Cherubim and the Seraphim, to praise and glorify God saying: "Holy, Holy, Holy, Lord God Almighty" (Rev. 4:8, Isaiah 6:2-3). We offer our oblation to the Lord; bread and wine, and receive back a Divine Gift; His Holy Body and Honored Blood. Here, in the U.S., the Coptic Liturgy is still celebrated in Coptic with parts in English and parts in Arabic. It is one of the most enchanting features of our Church. According to tradition, it was orally transmitted by Saint Mark, the Apostle, to other generations until finally it was recorded by Saint Cyril the Great, the 24th Pope of Alexandria, in the fifth century. It is regarded as the greatest, the oldest and the most complete text of the Divine Liturgy in existence. A sacrament is an invisible grace given under a material sign and administered by a canonical priest. We believe in Seven Sacraments. We call them the "Means of Salvation" or the "Means of Grace". They are actions through which the believer is made part of, and to grow on, the Lord. We obtain salvation through the blood of Jesus Christ. Salvation is a road that must be walked by the believer to the end. To us, salvation is only reached after a life long strife and struggle. Faith, Repentance and Baptism are the gates to Salvation. In the Sacrament of Baptism (Romans 6:34), we wash away the original sin through the blood of Jesus Christ, we are buried and raised with Him, receive a new life and become "children of God" (1 John 3:2). Coming out of the holy baptismal water, we receive the Holy Spirit through the Sacrament of Confirmation or Chrismation and become "temples of the Holy Spirit" (1 Corinthians 6:19). This sacrament was originally officiated by the laying of the Bishops hands (Acts 19:2-7, Hebrews 6:2). But now, our Church uses the holy oil. This holy oil, called the Myron, was first made by the Apostles of the spices and ointments that were prepared by the women for the Holy Body of the Lord after His burial (Luke 23:56, 24:1). Since then, new spices and ointments, with the same proportions, are added to the original Myron before it is depleted. This is done by the Pope and many Bishops in a great ceremony with special prayers, and distributed to all the priests of the Coptic churches in Egypt and elsewhere. Yet, the "New Life" as children of God requires constant nourishment and continuous growth. It is not easy. We are to "enter by the narrow gate" (Matthew 7:13-14). We are to guard against the old self and its natural vulnerability to sin (Romans 6:19). A Christian is susceptible to committing mistakes; so there must be a way available to him/her to be continuously cleansed and restored to full communion with Christ. Like Peter, in the day of the Last Supper, a Christian has to offer his dirty feet to the Church, which it washes and dries. If we refrain from doing this we lose our position with the Lord; just like Jesus told Peter in that same day, "If I do not wash you, you have no part with Me." (John 13:8). But, "if we confess our sins, He is faithful and just to forgive us our sins and to cleanse us from all unrighteousness" (1 John 1:9). The Sacrament of Penance and Confession is diligently practiced by the Coptic people "with fear and trembling" (Philip. 2:12). Coupled with penance and confession, the Sacrament of the Eucharist or Communion is reverently and continuously practiced by us for the "remission of sins" (Matthew 26:26-28). "He who eats my flesh and drinks my blood abides in Me and I in him" (John 6:56). The Church allows children to partake of the Holy Communion since baptism. As members of the Body of Christ, children must continue to be nourished on the heavenly bread and can not be spiritually starved. The Sacrament of the Unction of the sick (James 5:l4-15) has a clear place in the life of our Coptic Church. Whenever a believer is sick, he may ask to be anointed. The Unction of the sick is not reserved only for those who are at the point of death. Egypt and the Copts have been graced with many and unique blessings. Three of these blessings are (1) the Holy Family's flight to Egypt, (2) Great Church Fathers, and (3) Monasticism. The land of Egypt was blessed during the flight of the holy family to Egypt from the face of King Herod - "for Herod will seek the young Child to destroy Him" (Matthew 2:13). Churches, monasteries and landmarks have been built across Egypt at places where the holy family stayed or passed by. (See map) These landmarks are living testimonies to this blessed event in the history of Egypt. "Out of Egypt I called My Son" (Hosea 11:1, Matthew 2:15). At the southern-most point in Egypt where the holy family lived for six months, in a cave, a church was built in the first century. Its altar is set in that cave. Until now liturgical prayers are raised therefrom daily. Next to the church, Egypt's largest monastery is built on a twenty acre land that includes this blessed church. The era of Saint Athanasius, Saint Cyril the Great and Saint Anthony the Great, the Father of Monasticism, marks the golden age of the Oriental Orthodox Church. At the hands of Saint Athanasius and Saint Cyril the heretical movements of Arianism and Nestorism were defeated. Saint Athanasius is behind most of the text of the Nicene Creed. When still a young deacon, he came to the Council of Nicaea in 325 AD with his old patriarch, Bishop Alexander. In 328 AD, Bishop Alexander reposed in the Lord and Saint Athanasius succeeded him into a stormy reign. He was banished five times from his See, and spend more than 17 years in exile. His pastoral care is shown by his Episcopal Visitations, his Paschal Letters and numerous books and treaties. He reposed in the Lord in 373 AD. He was the 20th Coptic Pope Successor of Saint Mark. The following century saw yet another peer of Saint Athanasius, Saint Cyril the Great (412 - 444 AD), the 24th Pope of Alexandria, called the Pillar of the Faith. The greatest conflict of Saint Cyril's life was with Nestorius, the formidable Patriarch of Constantinople. Nestorius rejected the use of the term Theotokos - the Mother of God, for Saint Mary, whom he wanted to be called the Mother of Christ. This was a lead to the heresy that Jesus was a human being, in whom the Holy Spirit came to dwell at His baptism, and that in Him there is fellowship but not unity, between His divinity and His humanity. This concept was refuted by Saint Cyril of Alexandria and all the Council of Ephesus in 431 AD, as being a denial that Jesus Christ is God Incarnate. Saint Cyril left a tremendous number of works in Theology, Exegesis, Homilies, and Apologetics. His Theology is regarded by the Coptic Church as the key Reference of Orthodoxy. At the age of twenty, Anthony (251-356 AD), an orphan of wealthy Christian parents, renounced the world. He sold his estate, distributed the proceeds to the poor, and entrusted his younger sister to a community of virgins. For about 85 years he lived a solitary life and went further and further into the desert. Many disciples sought his spiritual guidance while they continued to lead solitary lives in the neighborhood of his cave. During Saint Anthony's life time, there developed a second stage of monasticism, which may be called "Collective Eremite"
The oldest settlement grew around saint Anthony in the district of Pispir and spread Eastward into the mountain where the monastery of Saint Anthony stands to the present day. Another community arose at Chenoboskion (modern day Nag-Hammadi) in Thebes, where Gnostic papyri was discovered. Three settlements in the Western Desert, namely Nitrea, were founded by Saint Arnoun, Cellia, the home of saint Macarius the Alexandrine, and Scetis, where Saint Macarius the Great founded another monastery about 330 AD. Today, thousands of monks and nuns in many, many monasteries all over Egypt dedicate their lives to Jesus. With their hermetic lives and spiritual wealth they enrich the Coptic faith and provide a Godly haven in their monasteries for visitors who hunger for a quiet time of rest and recuperation from their daily strife in this world. One of the magnificent wonders of this ancient Apostolic Church is the spiritual revival in all the Coptic Orthodox Churches worldwide in these days. There is an intense spiritual awareness in every church, among the youth in particular. As in the early church days, Christian Tradition is clearly reflected in the Copts' life style. Monasteries and convents throughout the Egyptian desert are now filled with monks and nuns. Even here in the US, you can smell the sweet aroma of monastic life when you visit our first Coptic Monastery, named after Saint Anthony the Great, in California. This spiritual revival in the Twentieth Century was inspired by the leadership of His Holiness the trice blessed the late Pope Shenouda III, who was gifted by God in teaching and preaching. His weekly sermons, over the 50 years, continue to be listened to by thousands of Egyptian Copts, and non-Copts. The spiritual revival of the Coptic Church is continuing under the blessing of His Holiness Pope Tawadrous the Second Pope and Patriarch of Alexandria and the see of St. Mark.